January to September 2017: Mercedes. BMW and Porsche had record sales worldwide while Audi sales were down and Volkswagen recovering strongly. During the first three quarters of 2017 German luxury and premium car brands continued to sell in record numbers worldwide and in the very important Chinese market. Mercedes Benz sales worldwide and in China improved the most in 2017 but BMW and Porsche also had record sales. Volkswagens again sold in record numbers in September 2017 with Germany the only major market where VW is still struggling. Audi sales worldwide were weaker thus far in 2017 mainly due to structural issues in China earlier in the year – during the third quarter of 2017, Audi sales improved strongly. *Volkswagen Group includes Volkswagen, Audi, Porsche, Skoda, Seat, Bentley, Bugatti, Lamborghini, MAN, Scandia. **BMW figures for China, USA & Germany include Mini. Statistics and definitions as per individual car manufacturers. *Volkswagen Group includes Volkswagen, Audi, Porsche, Skoda, Seat, Bentley, Bugatti, Lamborghini, MAN, Scandia. Note: all references to sales in this article refer to these deliveries reported by the respective manufacturers. Only the German registrations referred to below are actual KBA figures – there may be considerably delays between delivery, sale and actual registration. Mercedes Benz continued its record run with September 2017 the 55th consecutive record month, the third quarter of 2017 the best third quarter ever and the first nine months of 2017 the best start to a year ever. Worldwide Mercedes Benz car deliveries increased by 11.7% to 1,717,300 cars. Mercedes Benz sales in China increased by 30% to 442,899 cars to become the largest German premium or luxury brand in the world’s largest car market. Mercedes Benz thus moved ahead of the BMW Group for the first time in China and well ahead of Audi, long the market leader in China. However, Audi sales were recovering fast in recent months after structural adjustments in the business led to sharply weaker sales earlier in 2017. Mercedes Benz also remained the leading German luxury car brand in the USA thus far in 2017 despite sales contracting by 3%. Of the German luxury car brands, only the BMW Group that included Mini numbers performed worse thus far in the USA. In Germany, Mercedes Benz deliveries during the first three quarters of 2017 increased by 6% to 231,000 cars. Although this was slightly behind Audi, actual registration figures were strongly in favor of Mercedes Benz. Mercedes Benz was the second largest car brand in Germany during the first nine months of 2017 with 252,000 (+7%) Mercedes Benz cars registered. The BMW Group also continued to sell at record levels both for September and the first nine months of 2017. BMW Group sales worldwide increased by 3.7% during the first three quarters of 2017 to 1,811,234 deliveries including 1,537,497 (+3.9%) BMW cars and 271,394 (+2.7%) Mini cars. In China, BMW Group sales increased by a strong 15% to 436,657 deliveries during the first nine months of 2017 – only Mercedes Benz performed better. In the USA, BMW Group deliveries were down by 5% during the first three quarters of 2017. In Germany, the BMW Group had flat sales and lost market share in an expanding market. In September 2017, BMW for the first time ever sold more than 10,000 electric cars in a single month. Thus far in 2017, BMW delivered 68,687 (+64%) electric cars of its BMW i and Mini Electric brands – more than in the full 2016. The Volkswagen Group (including VW, Audi, Skoda, Seat, Porsche, MAN and Scania) had its best month ever in September 2017 when worldwide deliveries exceeded a million cars in a single calendar month for the first time ever with 1,010,100 cars delivered. During the first three quarters of 2017, VW Group deliveries worldwide increased by 2.6% to 7,806,700 cars. The VW Group had stronger sales in all regions of the world with Germany the only major car market with weaker sales for the group thus far in 2017. Volkswagen brand also had record deliveries for the strongest single month ever when in September 593,700 cars (+8.4%) were delivered worldwide including a record 310,500 (+7.5%) in China. 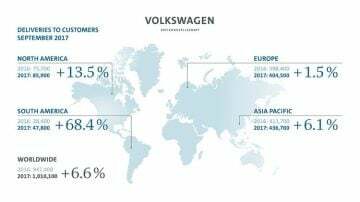 Volkswagen brand sales improved in most regions of the world during the first nine months of 2017 with the noticeably exception of Germany where deliveries were down by 7.4% to 399,800 cars. This dragged the whole European market down for VW with deliveries down 3.1% in Western Europe and 0.8% down in Europe as a whole. Sales in Eastern Europe were up by strong 15% including an 18% increase in Russia. Volkswagen claimed that orders in Germany were recovering strongly – in part due to huge discounts and incentives to trade in older diesel cars – but actual new passenger vehicle registrations during the first three quarters of 2017 were down 6.1% to 479,143 Volkswagens. In China, which accounts for nearly half of all Volkswagen sales worldwide, VW deliveries increased by 3.2% to 2,200,400 cars thus far in 2017. In the USA, VW sales are recovering after the problems of the past two years with deliveries up by 9.2% to 252,500 cars thus far this year. In September 2017, VW deliveries in the USA increased by a third to 32,100 cars. VW deliveries in South America increased by nearly a quarter to 315,000 cars thus far in 2017. Porsche also continued to sell in record numbers worldwide and in China during the first nine months of 2017. Worldwide, Porsche deliveries thus far in 2017 increased by 4% to 185,898 cars. Worldwide, the most-popular Porsche remained the Macan with deliveries up 4% to 73,000 cars. Deliveries of the high-earning Cayenne were down 3% to 49,000 – only a minor decline given that the replacement model was already shown at car shows. Deliveries of the new Panamera increased by 73% to 19,000 cars. In China, Porsche sales remained strong with deliveries increasing by a tenth thus far in 2017 to 54,090 cars. Porsche claimed traditional sport car sales are also increasing in China in addition to the very popular SUV models. In the USA, Porsche sales were flat with a 2% increase in deliveries to 41,237 cars thus far in 2017. Germany was the only weaker major market for Porsche with deliveries down 1% to 21,880 cars. Audi was the only luxury or premium German carmaker with weaker sales worldwide and in China thus far in 2017. Worldwide, Audi deliveries during the first three quarters of 2017 were down by 2% to 1,380,800 cars. Audi’s weak performance was largely due to sales contracting by 5% in China to 418,670 cars during the first nine months of 2017. 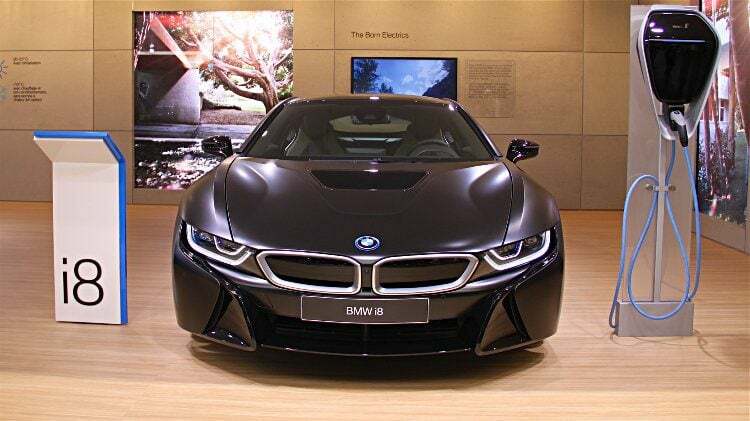 Audi was for years the leading German luxury car brand in China but has now slipped behind both Mercedes Benz and BMW that both increased sales strongly this year in China. Audi blamed restructuring of the business in China for weak sales earlier in 2017 in China. During the first half of 2017, Audi sales were down by 12% but improved strongly during the third quarter. In September 2017, Audi sales in China were again well ahead of the competition. In the USA, Audi sales continued to improve but the overall number remained well behind the competition from BMW and Mercedes Benz. In Germany, Audi deliveries were flat thus far in 2017 with only 0.7% growth to 232,518 cars. Actual registrations in Germany during the first three quarters of 2017 were down 3% to 220,958 leaving Audi as the third largest carmaker in Germany well behind Mercedes Benz.